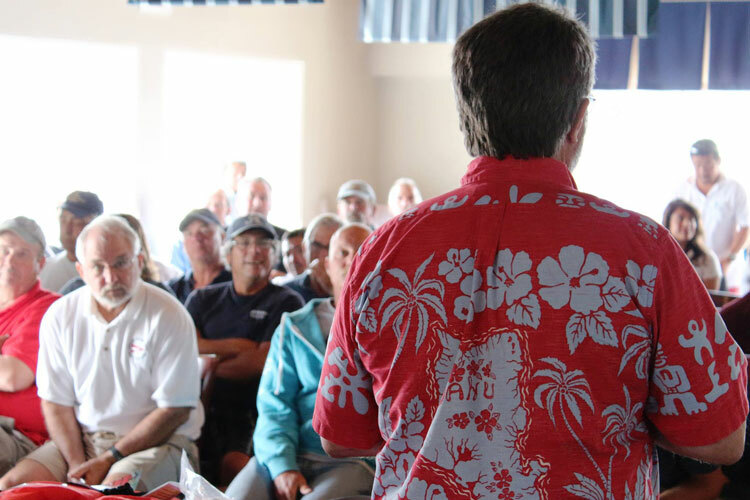 We’re pretty sure this is Bruce Brown’s back, a picture taken as he was teaching a Safety-at-Sea seminar in California (he hasn’t sent us any pictures so we snatched this from Facebook). You’ll see another side of Bruce at the meeting. 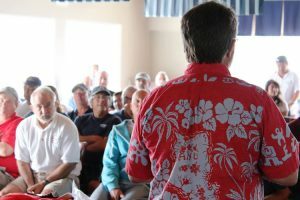 If you attend a safety-at-sea seminar on the West Coast, you’re likely to meet this guy: Bruce Brown. 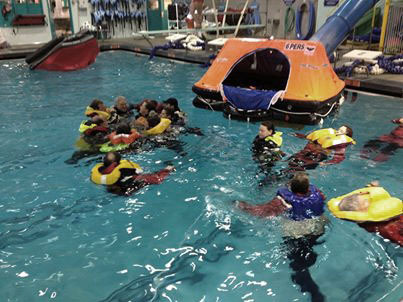 At this month’s meeting, he’ll tell us the best methods for crew overboard recovery and suggest the best choices for personal safety equipment. And we’ll have a report on it shortly. Bruce is a multi-time Past President of the United States Marine Association; he’s an instructor for the Coast Guard 100 Ton License Program; and he has extensive offshore racing experience, including skippering on the TransPac; and he specializes in evaluating safety products, such as life rafts, marine communication, and heavy weather forecasts. The meeting is Tuesday, March 11, beginning at 7pm (but arrive early for dinner). Monthly meetings are held at the Caddy Shack @ Rolling Hills Golf Course, 1415 North Mill Avenue, Tempe, AZ 85281-1205 (map) and both members and non-members are welcome to attend. Also on the program, a couple short videos from John deCastro, who was a Course Marshall for the America’s Cup last fall. He’ll briefly share some of his experiences. Checking out safety equipment in a pool. 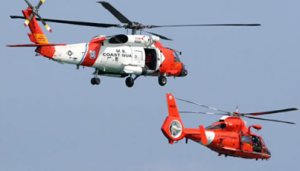 Best not to have any of these hovering over your boat in distress.